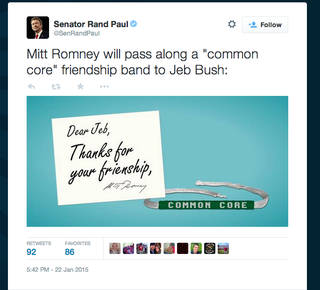 So: Rand Paul, 2016 presidential hopeful (LOL), is lonely and mad about the fact that Mitt Romney, 2016 presidential hopeful (LOL), is hanging out with Jeb Bush, 2016 presidential hopeful (LOL), in Utah right now. Though Romney and Bush are probably sitting very politely in stiff armchairs while surrounded by staff members in a room that either smells like your grandpa or, alternately, your grandma—while also mentally circling each other like bucks and daydreaming of elaborate murder scenarios that would thus free up the "path to the Presidency"—Rand Paul imagines a scenario of a gift exchange that would embarrass both Romney as a potential three-time candidate and Bush as a Republican that supports the Common Core. But, in his tweet mocking federal curriculum standards, he may have made a case for them at the same time. Thanks for your frienship, the Photoshopped note reads. F • R • I • E • N • S! LOL. You do you, Rand Paul. You just keep doing you.